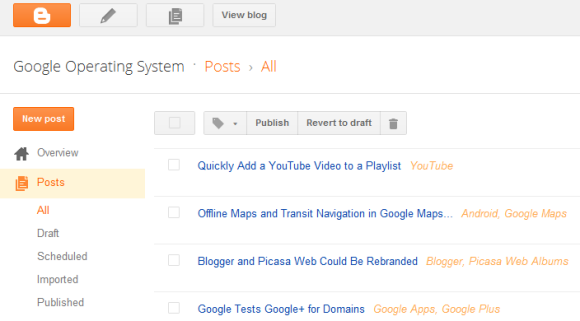 The new interface is now available in Blogger in Draft, but it looks quite different. “Over the last couple of months, we’ve made significant improvements to our new user interface. First and foremost, we’ve incorporated your feedback and made numerous fixes based on that feedback. Also, we’ve updated the look and feel of our new design, inspired by Google’s newest design evolutions,” explains Google. Blogger uses Ajax, so all the pages load a lot faster, including the post editor. Unfortunately, Blogger is still very slow when you perform a search and try to display posts or comments. Blogger’s new UI is cleaner and it offers additional information about your posts: the number of pageviews. Tabs have been replaced by a vertical menu and the list of labels is now a drop-down. The post editor is much better, especially if you use the default view. 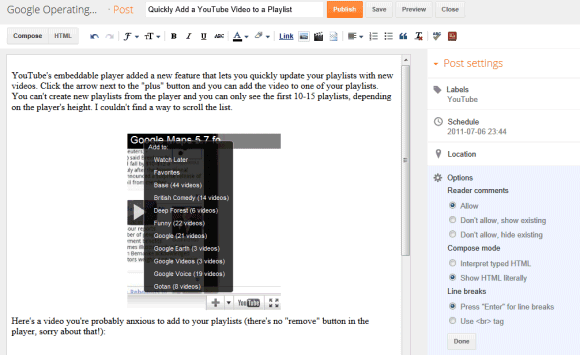 Blogger’s new editor takes up most of the page and post settings are now included in a sidebar. There’s a lot of white space in the new interface, buttons aren’t big enough to be readable and Blogger includes too much information that’s not very useful: the total number of published comments and the total number of pageviews. The new interface is a mixed bag: it’s modern, clean, faster and more powerful, but there are many things that need to be changed before replacing the existing interface. You can try the new UI at draft.blogger.com and you also have the option to make it the default interface.